Road Blocker guarantees maximum safety for the highly sensitive, highest security location against undesirable vehicles of different sizes and weights. Automatic rising kerbs are hydraulically powered by means of a standalone heavy duty hydraulic station. The power pack is generally mounted in a steel roadside cabinet like a safe box. The control box is a Programmable Logic Controller (PLC). The actual operating of the road blocker is by means of hydraulic cylinders, built underground within the main structure of the road blocker. The hydraulic oil is transferred through 1/2 high-pressure steel braided hydraulic hoses, which are professionally made to suit specific site requirements. The hydraulic power pack is equipped with either a single phase drive motor, or a three-phase motor, which 3.75 KW or 5.5KW to allow a very high load of operation. This is ideal for large car parks or busy sites, like the airport, a border checkpoint, prison, toll gate, etc. Hydraulic road blockers flushed mounted with the ground level at the entrances to provide safety. 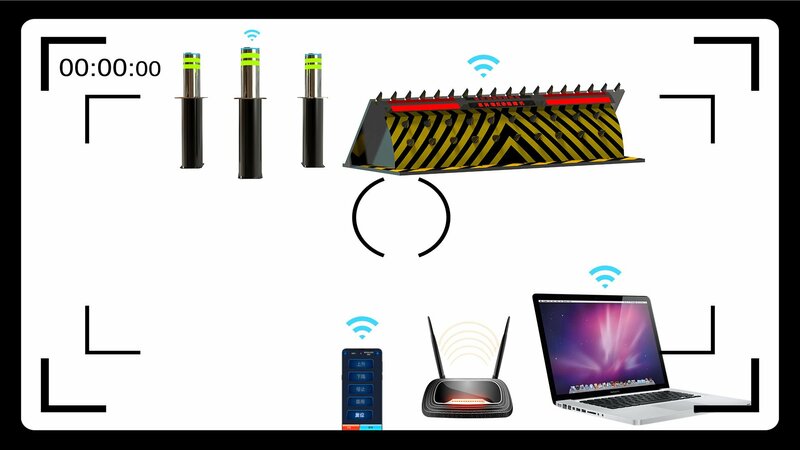 The road blocker can be in conjunction with any access control system, for example, RFID card swipe system, parking barrier system, ETC system. It is generally installed with ground loops for vehicle safety and red/green traffic lights to give an indication of when it is safe for a vehicle to proceed. We will provide 2 remote controllers and 1switch button as standard configuration. The LED strip design is our own design which is different from others. We can put the company name in the middle. The speed of our road blocker can be less than 1s. The hydraulic cylinder is with damper. It is fast speed but low noise. Our cellphone APP and PC software are also available on the rising road blocker the same as the automatic bollards. The APP can be downloaded on Android and App store. To be integrated with CCTV camera, the whole system can be a visible monitor system. The security people can monitor the site on cellphone or PC. If there is an emergency, remote control it by cellphone or PC. Each controller has a unique ID . Input the ID in the APP or software, it can control the road blocker. This is definitely enhancing the security level. An Emergency Fast Operate (EFO) unit can be added as an option into the controller. What`s more, There is an accumulator/handle for manual operation (in case of power failure). The average blocking height is 500 mm. The max can be customized to 1000mm. We can also provide OEM and ODM service. To get more information, please don't hesitate to contact us via email, tel, or fax. We will do our best to provide the best solution.